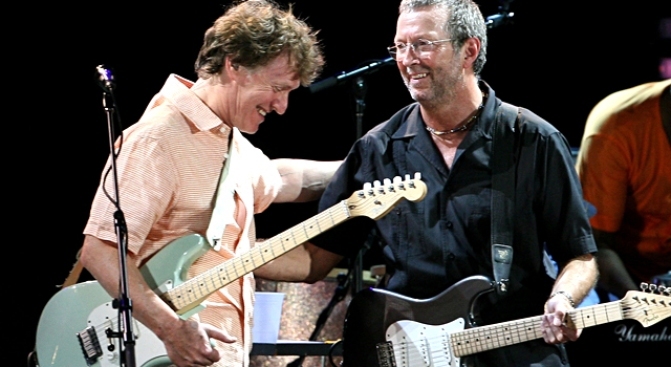 Musicians Steve Winwood, Eric Clapton hit the stage at the Oakland Arena tonight. ERIC CLAPTON & STEVE WINWOOD: The Oracle Arena will be jamming tonight as guitar masters Eric Clapton and Steve Winwood take to the stage. Tickets are still available for the 8 p.m. show. IN THIS CORNER: The popular (for whatever reason) activity known as pro wrestling comes to the HP Pavilion in San Jose. It's a battle of testosterone as a bunch of grown, oversized, underdressed men slam into each other in the ring. The WWE Monday Night Raw show starts at 5:30 p.m.
MAKE YOUR MONDAY: Mundane Monday will be a lot more fun with a drink at Fort Mason Center during the Make My Monday free happy hour. The event blends cocktails and culture and gives everyone a chance to meet local artists as they create original, affordable artwork available for purchase. It run from 6:30 - 9:30 p.m.